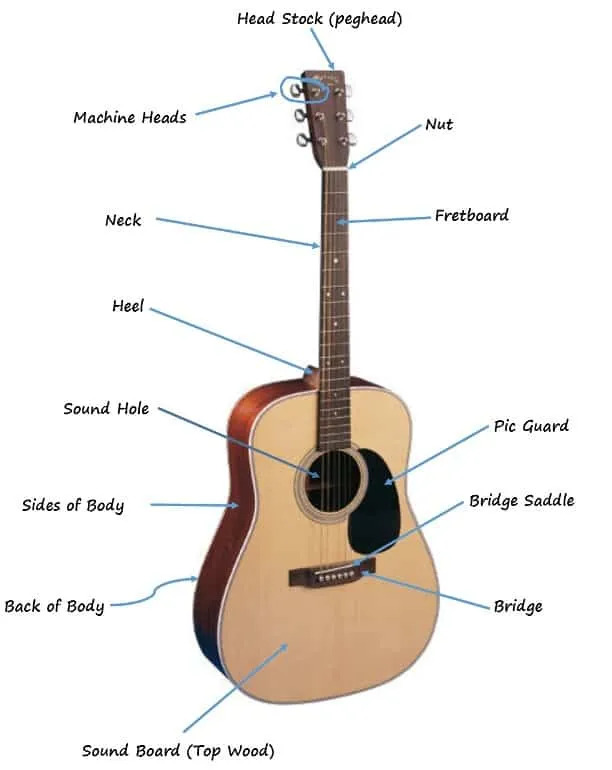 Below you’ll find a diagram of the acoustic guitar anatomy plus explanations for what each part is and what each part does. It’s not crucial to understand all the parts of the guitar if you are just a casual player and have no interest in doing your own guitar maintenance. However, if you are interested in how the guitar works and want to be able to do your own set up adjustments and upgrades then you’ll want to know your guitar intimately. The diagrams below show an acoustic guitar and all its relevant parts. O.K. let’s start from the top of the guitar and work our way down. The headstock is the wooden top of the guitar. It sits on the neck above the nut. The headstock plays an important role as it houses some very important components of the guitar – the machine heads. The headstock needs to be strong to be able to hold the tension of the strings. 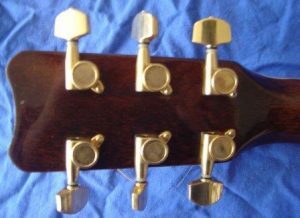 On the headstock of an acoustic guitar you will find 6 machine heads (on a six string guitar, 12 on a 12 string guitar) – one for each string. The machine heads have the important job of controlling the tension of the strings. Without them we wouldn’t be able to adjust the tuning of the strings. The machine head is made up of a few different parts. There is the tuning knob, the worm gear, the pinion gear and the capstan. The tuning knob is of course the part that you twist when you are tuning the guitar. There is a worm gear attached to the tuning knob which turns the pinion gear which winds the capstan. The Capstan has a hole in it for the string to go through. The string is attached to the capstan and winds around it as the string is tightened. On steel string acoustic guitars the gears are usually enclosed so you cannot see them. On a classical guitar the gears are usually exposed. Moving down from the headstock we have the nut. The nut is a piece of material that sits at the top of the guitar around where the neck and the headstock meet. It is most often white but is also commonly black. The nut is usually made from bone, synthetic materials made to emulate bone, plastic or fossil ivory. The nut has a few very important jobs. The neck is the back bone of the guitar. It houses the fingerboard of the guitar. It runs from the headstock and down to the body of the guitar. The neck needs to be strong to be able to handle the tension of the strings without bending, breaking or warping. But it should also be relative light so as not to add too much weight to the guitar. There are a number of different shapes and widths of necks – this can be a factor in helping to determine what style of music the guitar is best suited to. For example a wider neck is better for fingerstyle playing. Steel string acoustic guitars have truss rods running through the neck. This is a cylindrical steel rod that adds strength to the neck and allows you to adjust the “relief” of the neck if it is warped or you need to adjust it to adjust the action. The fingerboard sits on top of the neck and underneath the strings. It overlaps onto the body of the guitar and ends at the sound hole. This is what the guitarist presses the strings into. The fingerboard houses the frets. The frets are used as a guide to determine where you need to place your fingers to generate a certain note. There is such thing as a fretless guitar but these are very uncommon. 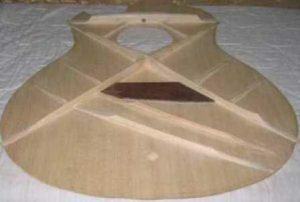 The heel joins the neck of the guitar to the body of the guitar. The heel is attached to both the body and the neck and ensures that both are strongly attached. Most acoustic guitar heels are glued to the neck and body but sometimes they are bolted. The soundboard is perhaps the most crucial part of the guitar when it comes to the sound quality of the guitar. Sound is transferred from the strings to the bridge and then through the soundboard. The soundboard has a sound hole in it to allow the sound to come through. This sound hole is usually one big hole that starts at the bottom of the fingerboard and is centered width-ways on the guitar. It is usually towards within the “upper bout” of the guitar. Though there are some guitars with different types of sound holes. Tops need to be relatively flexible so that they can vibrate. The back and sides of a guitar also influence the sound that the guitar makes. It isn’t as much of an influence as the top but still definitely plays a role. The wood used for the back and sides is sometimes the same as the top wood and sometimes different. This depends on the tone that the guitar manufacturer is looking for. There are some woods for example that would be used on the back and sides but not as a top and visa versa. The underside of the top has bracing on it. This bracing is used to add strength to the top – but is designed to enhance the sound and it still needs to allow the top to vibrate. There are many different types of bracing patterns and different techniques are used. The bridge is the connection between the strings and the soundboard. The bridge itself also houses the bridge saddle and the bridge pins. The bridge is usually made from a wood such as rosewood or ebony and needs to be hard and dense so it can transfer as much of the vibration from the strings as possible to the soundboard. The bridge saddle sits in the bridge and the strings lie on top of this. The saddle plays an important part in the tone and sustain of the strings – and it’s also important in terms of the guitars action (how high the strings sit above the fingerboard). The bridge pins hold the strings into the bridge. I hope you now know more about what the acoustic guitar’s anatomy, what each part does and why each part is so important. If you have any questions or comments or can think of any crucial part of the acoustic guitar that I have left out please feel free to leave a comment in the comments section below. If you want to learn more about the individual components check out the links under each component above.